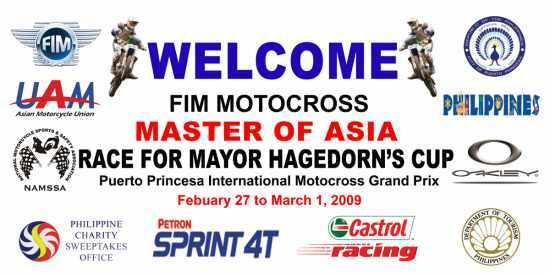 Foreign champions from competing countries are expected to give Filipinos a tough time for the overall crown of the 2009 Motocross Masters of Asia - Puerto Princesa International Motocross Grand Prix set February 27-March 1 at the Sta. Monica International Racetrack in Puerto Princesa City. Defending champion Erdenbileg Khaliunbold of Mongolia will lead the tough cast of world caliber riders set to arrive Tuesday next week for the biggest motorcycle motorsports spectacle sponsored by the City of Puerto Princesa, Philippine Charity Sweepstakes, Oakley, Castrol, CTI Knee Brace, Department of Tourism, Petron 4T, Insideracing and HJC helmets. This is the third year that Khaliunbold will be competing in the said event and has lured quite a big fan base from among Puerto Princesa City constituents who were really impressed with his skills and daredevil acts. Two years back, Khaliunbold showed great signs as a rookie when he wound up seventh in the Motocross Masters of Asia and 10th overall in the Asian Motocross series. He has vastly improved the following year and eventually captured the Asian motocross. But the Sta. Monica International Racetrack appears to be a big challenge for Khaliunbold as the Mayor Edward S. Hagedorn Cup — a sterling silver trophy coming from the city’s chief, has eluded him for the second time last year after wounding up only 10th. He will be backed up by three riders – Boldbautar Gan-od, Temuujin Khadbaatar and rookie Dashdondog Ochirsukh but this year could turn a lot tougher with equally tough rivals out to foil his title defense. Indonesia remains a big threat with its firepower with Alex Wiguna, who’ll be gunning for a back-to-back crown in the said event. Iran is also hoping to become another power in Asian Motocross behind Mojtaba Karimazadeh and Amireza Sabetifar who are eyeing to improve their last year’s 9th and 11th place finish respectively. Among the other Asian champs who have confirmed their participation are Suzuki factory rider and 2002 Japanese National Champ-freestyle rider Sinichi Kaga who will be the main instructor of AMSA Asian Motorcycle Sports Academy clinic; India’s CS Santosh, Hong Kong’s Vincent Lai, China’s Su Wen Min and Sri Lanka’s Tuan Ossen. The excitement and the intense action of the event will be a big treat for the constituents of Puerto Princesa City which will be celebrating its Foundation anniversary on March 4 as Mayor Hagedorn and City Administrator Atty. Rocamora, is personally overseeing the preparations for the said event. “Preparations are nearly complete and we’ve mapped out programs to make sure these foreign visitors will enjoy their stay here and win their support in the country’s bid for the inclusion of the Puerto Princesa Subterranean River National Park as one of the Seven Wonders of the World,” said Hagedorn. For details on the Motocross Masters of Asia, please check out wwww.namssa.org or www.asiamx.org or email namssa01@hotmail.com or call 0917.847.9785.